The Curious Incident of the Dog in the Night-Time has been an elusive play for me. It was playing in London the last time I was there, and it was sold out. It was also playing in New York the last time I was there, and it was also sold out. I had read the book on which this play is based, and I’d heard great things about the stage version, but for some reason whenever I was in a position to see it, I wasn’t able to get a ticket. Now, fortunately, the Rep is opening its latest season with this play, finally giving me the opportunity to see it, and this show is definitely worth the wait. Cleverly staged and impeccably cast, this is a profoundly moving production. If the title sounds like a Sherlock Holmes story, that’s no accident, because 15 year old Christopher Boone (Nick LaMedica) loves Sherlock Holmes stories, and when a mystery presents itself in the form of the death of a neighbor’s dog, Christopher is determined to solve that mystery. The mathematically gifted Christopher, who appears to be on the autism spectrum, lives in England with his father, Ed (Jimmy Kieffer) and goes to a “special school” which serves as the backdrop for much of the play’s action. His teacher, Siobhan (Kathleen Wise) encourages him as he writes a book about his discoveries in an investigation that leads him on an unusual path to an unexpected destination, and to some rather surprising revelations about his family and the people closest to him. On the way, we find out a lot about Christopher and how he sees the world and how he relates to those around him. The staging of this production is apparently a lot different than it’s London and Broadway stagings, which featured more special effects. This production, designed for the Rep by Narelle Sissons, isn’t as high-tech but it’s still wondrous. It’s essentially Christopher’s classroom, but the walls are decorated with various words and mathematical symbols, and areas for Christopher to write and draw as he takes us along on his extremely personal adventure. There are various movable set pieces as well, and the ensemble also contributes to the set in inventive ways as Christopher’s self-appointed mission takes him to new places, from his own neighborhood to bustling London and back again. The costumes by Leon Wiebers and the stunning lighting by Matthew Richards also contribute to the full realization of Christopher’s world. The show is dynamically staged, with a strong ensemble supporting the truly remarkable performance of LaMedica as Christopher. This is his story, and his world, and LaMedica inhabits the character and his world with energy, strength, and warmth that projects through his sometimes detached manner. Although the set, play structure, and production values do a lot in terms of bringing the audience into Christopher’s world, it’s LaMedica who most makes us care for this character. He navigates Christopher’s journey in a variety of emotions from cool detachment, to suspicion, to curiosity, to sheer joy when he’s solving complicated math problems. It’s a brilliant performance, ably supported by Kieffer as Christopher’s loving but weary and secretive father, Ed, by Wise as Christopher’s understanding and dedicated teacher, by Dale Hodges in various roles including a kindly neighbor of Christopher’s, and by Amy Blackman as Christopher’s mother, Judy. There’s also a strong ensemble playing various roles as needed, from teachers in Christopher’s school to neighbors and other people he meets in the course of the story. This is a profoundly moving play. It’s cleverly staged and fast-moving, with a good balance of humor and drama. It’s a fascinating exploration of this one young man’s life and character, and his own approach to the challenges, relationships, and revelations he encounters. This is an excellent start to the Rep’s new season, and a truly riveting theatrical experience. Repertory Theatre of St. Louis is presenting The Curious Incident of the Dog in the Night-Time until October 1, 2017. This isn’t opening week at the Muny, but it is for me. Unfortunately, I was out of town and unable to attend the first performance of the 2017 Muny season, Jesus Christ Supertar. That is especially sad because I heard it was an excellent production. Still, for me, the first Muny show of the year is the season’s second production, Disney’s The Little Mermaid. This is the second production of this adaptation of the popular animated film that the Muny has done, and I remember enjoying the last one but that was in the “old Muny” era so I’m not sure if a direct comparison is really possible. What I can say is that this version is visually stunning and extremely well cast, making for an entertaining evening of theatre in Forest Park. The story is familiar to anyone who has seen the film, although it has been altered slightly for the stage, and additional songs have been added. The mermaid of the title is Ariel (Emma Degerstedt), the golden-voiced youngest daughter of King Triton (Jerry Dixon), who rules the undersea realm but has trouble understanding his youngest child. Ariel herself is obsessed with the world of humans, often journeying to the surface of the sea and collecting trinkets and keepsakes of the world beyond the ocean. She eventually encounters the human Prince Eric (Jason Gotay), who isn’t happy with his life as a prince and longs for a life at sea. When Eric is shipwrecked and Ariel saves him, Ariel’s fascination with humans turns into love for this particular human, and that’s where the Sea Witch Ursula (Emily Skinner) becomes involved. Striking a deal with Ursula that will give her legs in exchange for her voice, Ariel must get Eric to kiss her within three days or else she forfeits her soul to Ursula. With the help of her friends Sebastian the crab (James T. Lane), Flounder the fish (Spencer Jones), and Scuttle the seagull (Jeffrey Schecter), Ariel sets out to achieve her goal while Eric’s guardian Grimsby (Richard B. Watson) suggests a singing contest to find the girl with the beautiful voice who rescued Eric, and whom the prince–who is expected to marry by his 21st birthday–is determined to find and hopes to wed. The structure of the show is similar to the film, but has been expanded for the stage, and some plot details altered to better fit the stage format. For the most part, this story works, although I still question the inclusion of the song “Les Poissons”, since it makes little sense on stage even though Frank Vlastnik as Chef Louis performs it well and with lots of energy. The ending, especially Ursula’s fate, also isn’t as dramatically satisfying as the film version, although I do like that the development of Ariel and Eric’s relationship is given a little more focus. Still, this is a vibrant, energetic show with a lot of great songs including (and especially) the film classics like “Part of Your World”, “Under the Sea”, “Poor Unfortunate Souls”, and “Kiss the Girl”, and the Muny has brought the show to life with style and stunning visual effects, with a colorful, versatile set by Michael Schweikart, excellent costumes by Robin L. McGee such as the truly magnificent Ursula costume for Skinner and the ensemble members who play her tentacles. There’s also excellent lighting by Nathan W. Scheuer, video design by Matthew Young that augments the scenery well, and some truly clever puppets designed by Puppet Kitchen Productions, inc. The undersea world, as well as the dry-land world of Eric’s court, are well represented here on the giant Muny stage. There’s a great cast here, as well, led by Degerstedt’s determined, wide-eyed, clear-voiced performance as Ariel. Her chemistry with Gotay’s smooth-voiced, earnest Prince Eric is strong, and their scenes together are a highlight of this production. Skinner makes the most of the villain role as Ursula, reveling in her evil schemes and commanding the stage on her featured number, “Poor Unfortunate Souls”. She’s supported well by the gleefully oily characterizations of her henchmen, electric eels Flotsam and Jetsam, by Kevin Zak and Will Porter. There are also strong performances from the young Jones as Ariel’s devoted friend Flounder, and Schecter as the wisecracking, overconfident seagull Scutttle, who leads a group of other gulls in a memorable tap-dance number, “Positoovity”. Lane, as Ariel’s friend and reluctant guardian Sebastian, has some excellent moments leading the iconic songs “Under the Sea” and “Kiss the Girl”. The leads are supported by a strong, vividly outfitted ensemble playing everything from an array of undersea creatures to palace guards and princesses. The Little Mermaid is not the best of Disney’s stage musicals, but it is fun and it has it’s memorable moments. At the Muny this time around, it’s especially striking in a visual sense. This production is essentially what audiences would want it to be–a big, bright, energetic musical that fills the Muny stage well and entertains viewers of all ages. The Muny is presenting Disney’s The Little Mermaid in Forest Park until June 29, 2017. “Fun” is the first word that comes to mind when thinking about the Muny’s latest production of Young Frankenstein. Based on the classic Mel Brooks movie, this production sends up and pays homage to old-time horror films in general and the Frankenstein story in particular, with great production values and a lot of energy and humor. The well-chosen cast members seem to be having the time of their lives on stage, and that energy translates well for the audience. Although this show is essentially the film on stage with songs added, the story is expanded upon slightly as well, and the jokes are plentiful, with an emphasis on innuendo and some physical comedy. The show has also amped up the “song and dance” elements, making the most of the musical comedy genre. The story’s central figure is Dr. Frederick Frankenstein (Robert Petkoff), grandson of the infamous monster-creating Victor Frankenstein, who has recently died, leaving his Transylvanian estate to his grandson. The younger Frankenstein is a respectable scientist, insisting on pronouncing his last name “Frahnk–en-steen” so as to distance himself from a troubling family legacy. Frederick boards a ship overseas, bidding farewell to his physically averse fiancee Elizabeth (Jennifer Cody), and finally arriving in Transylvania, where he meets his assistants Igor (Steve Rosen) and Inga (Stephanie Gibson) and the mysterious housekeeper Frau Blucher (Vicki Lewis), whose name is always accompanied by the sound of horses neighing, as in the film. Although Frederick initially resists, he’s soon drawn to “Join the Family Business” (according to the song) and revisit his grandfather’s experiments with reanimating the dead. It’s an exaggerated “dark and stormy night” type of atmosphere throughout, as the suspicious villagers seek to find out Frederick’s plans, and Frederick hopes to bring to life a creature with intelligence and heart along with his giant stature and brute strength. As a show, this production is carried by the strength of its cast and seemingly boundless energy. Everyone seems to be having a wonderful time on stage, and it shows. Although some jokes occasionally fall flat, and a few of the songs are essentially just extended gags, this production simply works. The casting is excellent, from Petkoff’s overly determined Frederick, to Rosen’s delightfully goofy Igor who interacts delightfully with his fellow actors and with the audience, to Timothy Hughes’s charming, tap-dancing Creature, to Lewis’s melodramatic Frau Blucher (cue horse sounds), to the excellent comic performances of Frederick’s competing love interests, Gibson as the enthusiastic Inga, and Cody as the overbearing Elizabeth. There’s a strong ensemble, as well, serving the production well during the group numbers, such as the Act 1 ending “Transylvania Mania” and the inventively choreographed large-scale tap performance of Irving Berlin’s “Puttin’ On the Ritz”, the only song in the production that wasn’t written by Brooks, used here ostensibly because it was in the film. Here, it’s been hammed up delightfully, filling the huge Muny stage and providing one of the highlights of this production. The set and special effects add much to the spirit of this production. Paul Tate dePoo III’s set provides the ideal backdrop for the action, with a suitably creepy castle that rotates to display Frankenstein’s laboratory, using the Muny’s turntable to excellent effect. The costumes, originally designed by William Ivey Long with additional design and coodination by Tracy Christensen, appropriately suggest those of the film while being ideally augmented for the stage. The movie was filmed in black and white, but this production is in full color, evoking the gloominess of the Transylvania setting with excellent effect. There’s also excellent atmospheric lighting by Rob Denton and creative video design by Matthew Young. This isn’t an all-ages show, really. In keeping with the raunchy, innuendo-laden tone of the original film, this production is more suited for adults and older teens than for children. Young Frankenstein at the Muny is an energetic, joke-filled, hilariously hammy production. One of the best things about it is that the cast members seem to be having just as much fun presenting the show as the audience is watching it. The Muny is presenting Young Frankenstein in Forest Park until July 19th, 2016. I have to admit I’m often skeptical of “jukebox musicals”. There are great ones, like Jersey Boys, that manage to tell a compelling story as well as presenting the music of the play’s subject. There are others, though, that have less of a story and seem to be just an excuse to string a bunch of memorable songs together onstage without much of a plot. Fortunately, the Muny’s current show Buddy: The Buddy Holly Story is an example of the kind of jukebox musical I like. The show, cleverly presented and impeccably cast, presents the story of one of rock ‘n roll’s most influential early artists in a thoroughly enjoyable way that celebrates Holly’s musicianship and innovation in a thoroughly entertaining manner. The show follows the rise to fame of one of the rock world’s early stars, showing his relationships with his bandmates, producers and the general public as now-familiar hits form the soundtrack. Commendably, a great deal of the music is played live on stage by the performers as well. We get to see Holly (Andy Christopher) and his band the Crickets (Joe Cosmo Cogen as Jerry Allison, Sam Weber as Joe B. Mauldin) as they develop their country and blues influenced rock sound. We see the early recording sessions in which producers tried to force a more traditional country sound on the band, whereupon Holly looked for and found a new producer, Norman Petty (Michael James Reed), and so the hit records began. Through a judicious use of Holly’s music and well-known classics like “That’ll Be the Day”, “Peggy Sue” and a particularly effective use of “Everyday” we get to see the band’s creativity in process. Their rise to fame follows, with their memorable appearances at New York’s famed Apollo Theatre. Act II covers the later developments of the band and Holly’s personal life, including tensions with the band and his whirlwind romance with wife Maria Elena (Sharon Sayegh), leading to a lovely acoustic guitar-accompanied version of “True Love Ways”. Then it’s off to Clear Lake, Iowa, and the ill-fated Winter Dance Party tour along with the Big Bopper (Chrstopher Ryan Grant) and Ritchie Valens (Nicholas Rodriguez). While the tragic events following the Clear Lake concert are mentioned, the overall air of that concert presentation and the tribute that follows are more celebratory than mournful. It’s a tribute, first and foremost. While it’s not the most detailed of books for a musical, the script is solid, and the music takes the lead in telling the story. It’s an effective presentation characterized by charm, energy and impressive musicianship, led by the charismatic Christopher as the amiable but occasionally hot-tempered Holly. There are strong performances all around, particularly by Weber as Mauldin, who shows some impressive acrobatic bass playing skills. There’s also a vibrant turn by the excellent Apollo musicians, led by singer Teressa Kindle. The musicians (Troy Valjean Rucker, Theodore Brookins, Lamar Harris, Jahi Eskridge, and Nick Savage) also appear at the Winter Dance Party sequence in the second act, providing strong accompaniment to the energetic performances of Christopher, Grant, and Rodriguez. Sayegh as Maria Elena, Reed and Norman Petty, and Jo Lynn Burks as Petty’s piano-playing wife Vi provide strong support, as does the terrific Muny ensemble. The show is replete with 50’s flair with the bright, period-specific costumes designed by Tracy Christensen, and Robert Mark Morgan’s evocative, versatile modular set. There were a few sound issues on opening night, as well as one noticeable extended scene change that resulted in a missed cue and delayed entrance, but it was covered well and didn’t diminish the overall professional quality of the show. Buddy Holly’s music continues to make an impression today despite his short life and career. At the Muny, his legacy is boldly and ably represented in this tuneful, highly entertaining celebration of this supremely talented man and the early days of the rock ‘n roll era. The final sequence, featuring the entire ensemble in a medley of memorable rock hits by Holly and others, is simply a joy. It’s a fitting celebration of a legend, his music, and a time that shaped rock ‘n roll history. 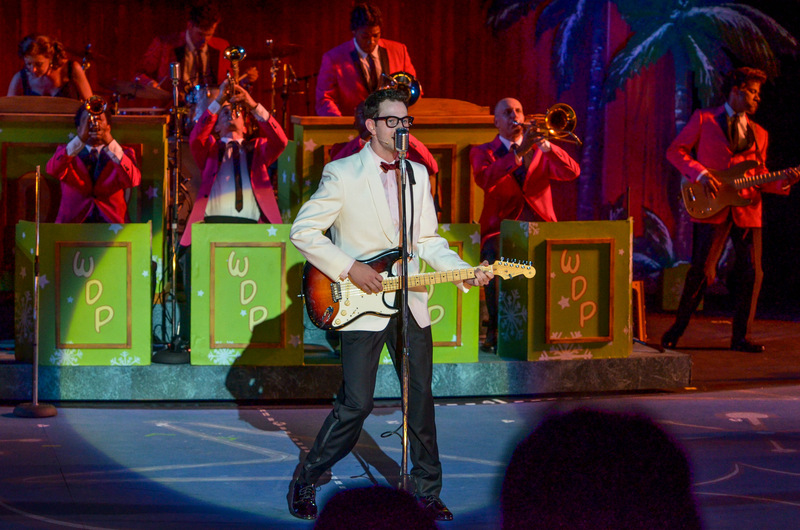 Buddy: The Buddy Holly Story runs at the Muny in Forest Park until July 19th, 2015. A “Family” That’s So Much Fun, It’s Scary! One of the things I always loved about The Addams Family in all its incarnations is how much fun the characters always seemed to have as a family. From Charles Addams’s classic comic panels to the 1960’s TV series, to the feature films in the 1990’s, this was a family that, while noticeably unconventional, offbeat and decidedly macabre, sincerely loved one another and made the most out of life. I used to look forward to watching reruns of the show after school when I was younger, and I enjoyed the movies as well, but I have to admit I was skeptical about the musical. I had heard of the mixed reviews on Broadway, and the adjustments to the show that were made for the tour, and I just didn’t know what to expect. The cast, led by Muny veterans Rob McClure, Jenny Powers and Jennifer Cody, looked extremely promising, and I sat in my seat on opening night with high hopes. I was not disappointed. In true Addams tradition, this is a show about love, lunacy and a great deal of laughs. 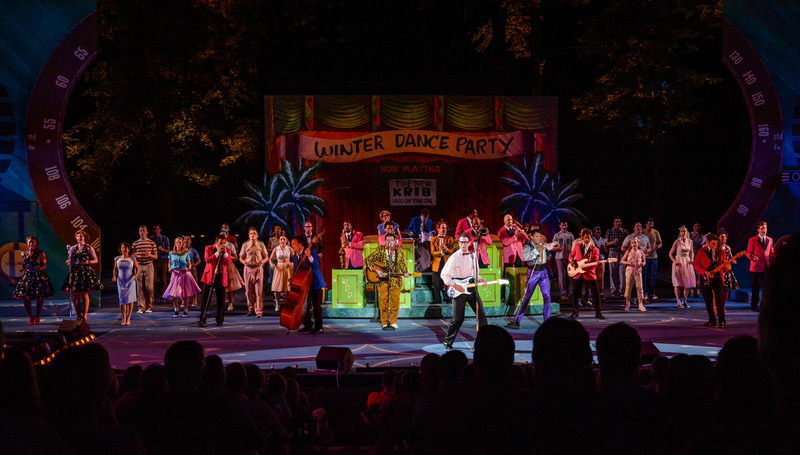 It’s a very fun show that blends elements of the cartoons, the TV show and the movies along with a new twist to make for a thoroughly enjoyable evening of theatre works surprisingly well on the giant Muny stage. This version of the story, which seems to take some inspiration from theatrical classics like You Can’t Take It With You and La Cage aux Folles, takes the familiar characters and introduces new ones to tell a story of unlikely love, culture clashes, and parents’ dealing with their children’s growing up. The book by Marshall Brickman and Rick Elice is full of witty jokes, plot twists and revelations, and there are some memorable songs by Andrew Lippa as well as an echo of the iconic TV theme song in the overture (with the audience enthusiastically clapping and snapping along). After we are re-introduced to the famous family including Gomez (McClure), Morticia (Powers), Pugsley(Michael Harp), Grandma (Cody) and Lurch the butler (William Ryall) in an energetic, colorful production number called “When You’re an Addams”, the storytelling duties are then taken over by Uncle Fester (Steve Rosen), who serves as something of a Master of Ceremonies and tour guide through the ensuing story, which Fester reminds us is ultimately about love. Gomez and Morticia have to deal with the fact that their daughter Wednesday (Sara Kapner) is growing up. In fact, she’s met a nice, respectable young man, Lucas Beineke (Dan DeLuca), and they want to get married, which is part of the problem. Lucas’s parents, Mal (John Scherer) and Alice (Hollis Resnick) have been invited to dinner at the Addams mansion, and both Wednesday and Lucas are afraid of being embarrassed by their parents. Meanwhile, Wednesday has confided a secret to Gomez, which she has made him promise not to tell Morticia, from whom Gomez never keeps secrets. Gomez’s dilemma, along with the various culture conflicts and what happens when even more secrets threaten to be revealed, becomes the basis for a hilarious and heartwarming tale of love and unconventionality told only as an Addams could tell it. While the darker, more overtly spooky atmosphere of the cartoons and the films is present as well, the general tone of the musical seems to be more in the vein of the TV show (albeit a little more risqué at times), with its broad comedy, sight gags and joke-a-minute humor. The comedy is in excellent hands, as well, with Rosen as a Vaudevillian-styled Fester and Cody as the outspoken Grandma delivering many of the best jokes in scene-stealing performances. The “Full Disclosure” number that ends Act 1 is one of the funniest scenes I’ve ever seen at the Muny, with so much raucous humor that it’s difficult to pause and take a breath. Just when I thought I was laughing as much as I could, another joke would come along to make me laugh even more. There are also some great moments for Kapner and Harp with the delightfully unhinged song “Pulled”, and for Resnick as the outwardly happy, frequently rhyming Alice, who gets to reveal her own dark secrets in a cathartic moment at the end of Act 1. She and Scherer as the bewildered Mal, along with a well-matched Kapner and DeLuca, also have an excellent moment in Act 2 with “Crazier Than You”. In fact, all the principals here are ideally cast, and everyone gets a moment to shine, including Fester with his sweet ode to his secret crush “The Moon and Me” (along with some excellent visuals on the scenery wall), and Ryall as Lurch, whose confusion about how to act when he meets the Beinekes is endearingly hilarious. There are some great “breaking the fourth wall” moments as well, with Rosen’s little stand-up routine at the beginning of Act 2–featuring some Muny-specific jokes–being a real highlight. 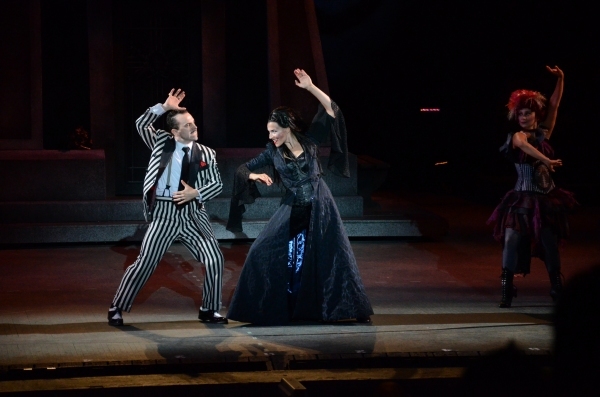 As great as the supporting cast is, however, this being The Addams Family means the stars of the show have to be Gomez and Morticia, and the Muny has cast these celebrated characters very well indeed. Both McClure and Powers are at their best here, and that’s saying something, considering the excellent performances I’ve seen from them in past Muny shows. Something about these characters just seems to energize these two, and they work together with crackling chemistry and a great deal of charm. Powers is in great voice on songs like “Secrets” and her big production number “Just Around the Corner”. She displays just the right balance between elegance and enthusiasm, as well. McClure is a joy as Gomez, as well, bringing charisma, wit, emotion, comic timing and boundless energy. He’s able to command the stage in a dynamic fencing routine, express his dilemma humorously in “Trapped”, and also share a poignant moment with Kapner’s Wednesday on the wonderful “Happy/Sad” in Act 2. He and Powers are well-matched in their electric, expertly choreographed “Tango de Amor” as well. These two consummate professionals fill their roles with humor and style, leading a strong principal cast and equally excellent ensemble of undead ancestors, skeletons and such. Visually, the set by Michael Schweikart fills the vast stage with just he right air of whimsical creepiness, with a detailed graveyard set and the house,which revolves to show different rooms such as the main hall and the dungeon. The costumes, designed by Andrea Lauer, are influenced by the earlier incarnations of the characters but are appropriately updated for this setting. 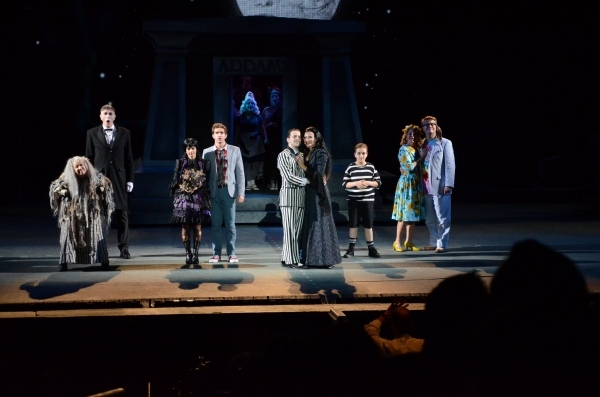 I especially liked the individual styling of the various Addams ancestors. There were some obvious issues with the sound on opening night, with a few lines being lost due to microphone problems, although I’m sure those will be sorted out as the show continues its run. Overall, this production a strong technical achievement, with elements fitting the overall darkly madcap atmosphere very well. The Addams Family is, as Fester says, ultimately a story about love. It’s about trust, acceptance, and unconventionality, but its all tied together by love. While I think the original TV show will always be my favorite version of these characters, the musical is a surprising delight as well, especially in this larger-than-life production at the Muny. It’s creepy, it’s kooky and it’s contagiously fun. This is a family that’s well worth getting to know, and the Muny provides an excellent–and outrageously funny–introduction.